When it comes to the well being of your pet, poor dental health is about so much more than bad breath! According to the American Veterinary Dental Society, 80% of dogs and 70% of cats will show signs of periodontal disease by the age of three! The inflammation and infection associated with periodontal disease leads to bacteria in the bloodstream, which can cause heart, lung and kidney disease. Periodontal disease includes inflammation of the gums (gingivitis) and the loss of bone and supporting tissue around the teeth. As periodontal disease progresses, teeth become loose and cavities develop. These conditions are very painful for pets, and can lead to difficulty eating, decreased appetite, weight loss and a general decrease in your pets activity level. Surprisingly, most pets with painful periodontal disease don’t actually show any symptoms! Even pets with fractured or broken teeth won’t necessarily let you know they are hurting. What can you do to prevent periodontal disease in your pet? Brush their teeth! Sounds crazy, right? Think of it this way: If you didn’t brush your teeth today, you’d get plaque buildup. Plaque is that weird, slimy film you can feel, and it’s made up mostly of bacteria. If you kept forgetting to brush your teeth, that plaque would harden into tartar, and you would develop signs of periodontal disease. Your dog or cat’s mouth may look different than yours, but it works the same way! Daily brushing is the best recommendation we can give when it comes to maintaining your pet’s oral health. C.E.T. Toothpaste is made with chlorhexidine, which is an enzyme that breaks down plaque before it hardens into tartar. This toothpaste is made specifically for dogs and cats. It comes in tasty flavors (like chicken!) and is not harmful if swallowed. 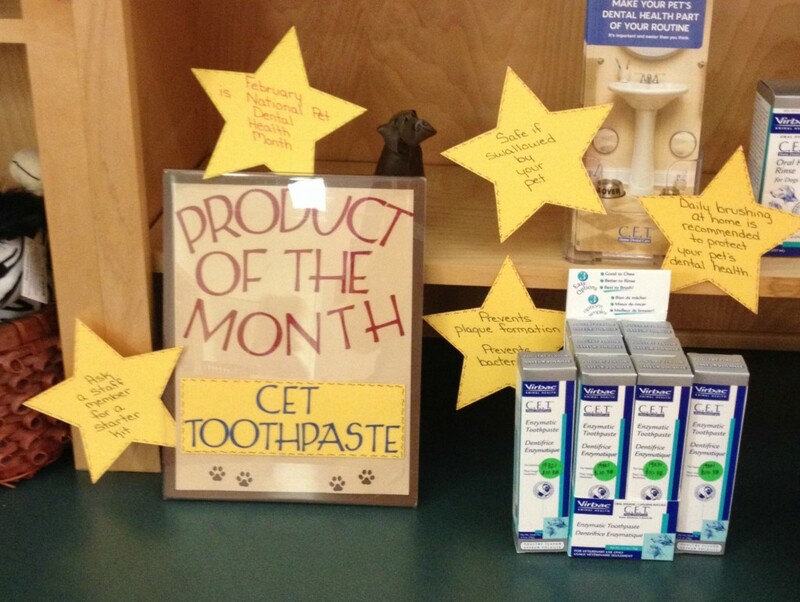 Stop into the animal hospital anytime and ask a staff member for a dental care starter kit. We’ll give you a C.E.T. Toothpaste sample, a tooth brush and a guide on how to brush your pets teeth.